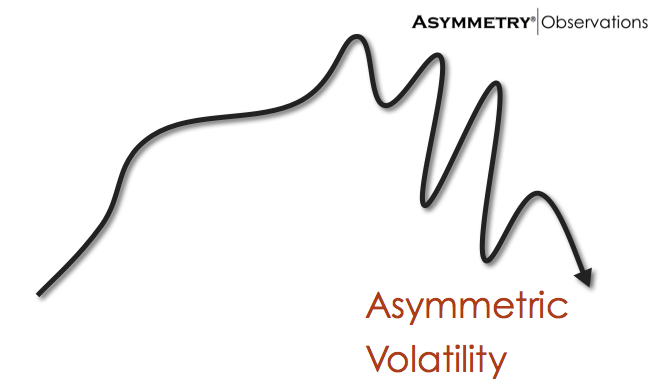 Asymmetric Volatility is the observation that volatility is higher in declining markets than in rising markets. Asymmetric Volatility is when the volatility of a market or stock is higher when a market is in a downtrend and volatility tends to be lower in an uptrend. There may be a range of causes of asymmetric volatility, but factors such as leverage, panic selling, and serial correlation are often some of the drivers. We observe that gains and losses in equity markets tend to be asymmetric. That is, upward trends tend to drift slower and less steep, and downtrends tend to be sharper and steeper and become waterfall declines. We observe fewer geysers than waterfalls. Below are links to papers on the topic of asymmetric losses and asymmetric volatility. In addition, we observe higher volatility during downtrends than uptrends. That is, the range in daily prices tend to be higher during downtrends than uptrends. When prices are drifting up, investors seem to become more and more complacent so there is less indecision and therefore less range in daily prices. This phenomenon is called the “Asymmetry Volatility Phenomenon”. Another driver of higher downside volatility may be caused by leverage. For example, leverage requires one to reduce leverage as losses increase to avoid a margin call. Or, if leverage and exposure isn’t reduced as losses increase a margin call can force selling. It appears that volatility in equity markets is asymmetric: returns and conditional volatility are negatively correlated. We provide a unified framework to simultaneously investigate asymmetric volatility at the firm and the market level and to examine two potential explanations of the asymmetry: leverage effects and time-varying risk premiums. Our empirical application uses the market portfolio and portfolios with different leverage constructed from Nikkei 225 stocks, extending the empirical evidence on asymmetry to Japanese stocks. Although volatility asymmetry is present and significant at the market and the portfolio levels, its source differs across portfolios. We find that it is important to include leverage ratios in the volatility dynamics but that their economic effects are mostly dwarfed by the volatility feedback mechanism. Volatility feedback is enhanced by a phenomenon that we term covariance asymmetry: conditional covariances with the market increase only significantly following negative market news. We do not find significant asymmetries in conditional betas.